What is the purpose of the Stainless Steel Belt Barrier? This attractive stainless steel belt barrier is designed to provide form and function all at once. Designed to assist in marking lines for crowds and to discourage people from cutting in line, jostling or rushing attendants, this pedestrian barrier helps crowds stay organised, orderly and calm throughout an event. The stainless steel post belt barrier is perfect for use in upscale venues such as cinemas, nightclubs and showrooms. Its anti-fingermark finish and freestanding construction make it a visually attractive piece of equipment that won’t detract from beautiful or artistic surroundings. 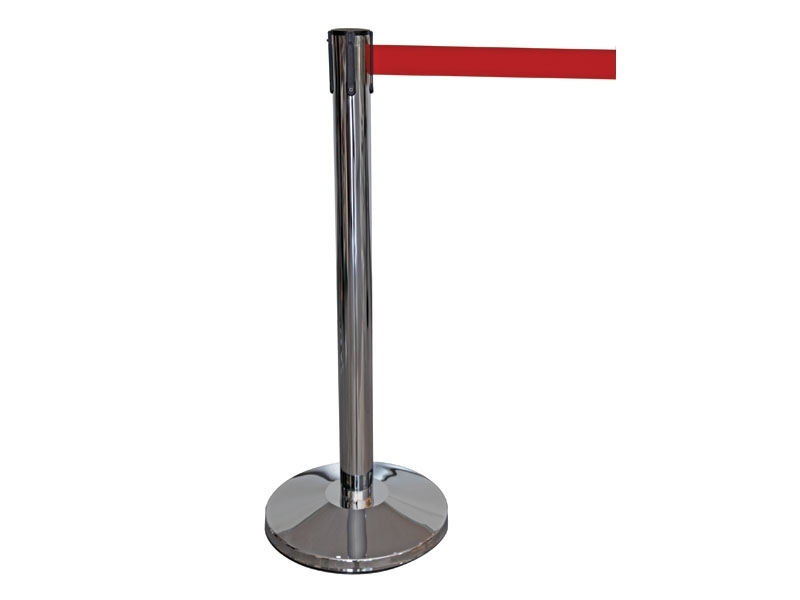 Additionally, its 350 mm reinforced concrete base mean that this belt barrier will not mark carpets and is capable of handling wet or uneven conditions during outdoor events. Who might use this Queue Management System? Ideal for ushers, hosts, curators or museum staff, this product is designed to be used by people running important events. Made for functional crowd control with a user friendly construction and outlook, this stainless steel post belt barrier is easy to set up, arrives via free next day delivery and can be assembled without a hassle, even for a novice. Use it for many events both now and in the future and you’ll be impressed by its ongoing functionality and superb construction. This belt barrier is available for next working day delivery and features a 1-year warranty on parts and labour. The belt barrier also features a freestanding stainless steel post, a 100% chevron webbing belt with a built-in braking system, which means the belt will not release suddenly when bumped or tampered with. For your convenience, the belt comes in 3 colors and is 2m long by 48 mm wide. The belt also offers 4 connectivity options and affixes securely to the 890H x 63D (mm) post. The post’s 8.2 kg weight make it a sturdy and attractive work companion.